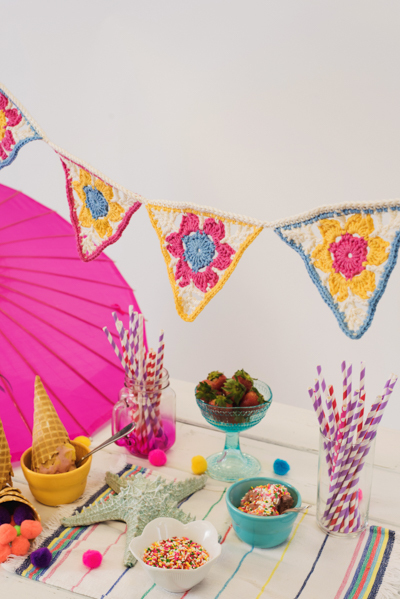 Bunting is one of the greatest ways to decorate any space and add a fun pop of color to a party! 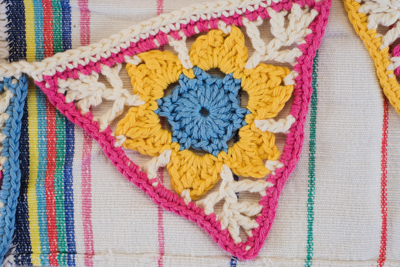 The center of each triangle of the Sweet Pea Bunting features a lovely and vibrant flower, making it the perfect option for celebrating the start of summer with garden picnics and parties! Schoeller+Stahl Record 210 (100% Cotton; 98 yards [90 meters]/50 grams): 141 Bleu (A), 1 (1) ball; 091 Mais (B), 1 (1) ball; 080 Natur (C), 1 (2) ball; 096 Rosa (D), 1 (1) ball. (Yo) 3 times, insert hook into a st, yo, and pull back through st (4 loops on hook), yo, pull through 2 loops, yor, pull through 2 loops, yo, pull through last 2 loops. The triangles are worked in the round. 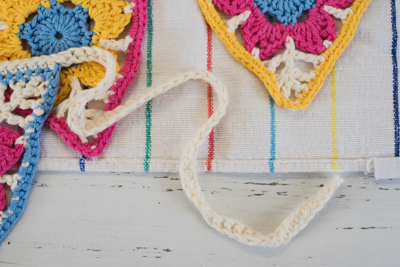 The bunting string is worked in rows, from the bottom to top. 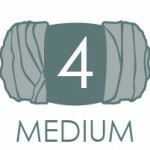 Create a magic circle, ch 2. Rnd 1: Work 18 dc in magic circle, sl st in first dc of this rnd – 18 sts. Rnd 2: Ch 1, sc in same st, *ch 3, sk next st, sc in next 2 sts; rep from * 4 more times, ch 3, sk next st, sc in next st, sl st in first sc of this rnd – 12 sts. Rnd 3: Attach new color in first space between 2 sc made in previous rnd, ch 1, sc in same st, *(sc, 2 dc, tr, ch 2, tr, 2 dc, sc) in next ch-3 sp (flower petal made), sc in next sp between next 2 sc made in previous rnd; rep from * 4 more times, (sc, 2 dc, tr, ch 2, tr, 2 dc, sc) in ch-3 sp (flower petal made), sl st in first sc of this rnd – 54 sts. Rnd 4: With new color, str in sc from previous rnd, *ch 3, sc in ch-2 corner of petal, dtr in sc, ch 1, tr in side of last dtr (first tr), ch 1, tr in side of last tr (2nd tr), ch 3, dc in side of last tr, ch 1, tr in same sp as 2nd tr, ch 1, tr in same sp as tr, sc in ch-2 corner of petal, ch 3, tr in sc; rep from * once more, ch 3, sc in ch-2 corner of petal, dtr in sc, ch1, tr in side of last dtr (first tr), ch 1, tr in side of last tr (2nd tr), ch 3, dc in side of last tr, ch 1, tr in same sp as 2nd tr, ch 1, tr in same sp as first tr, sc in ch-2 corner of petal, ch 3, sl st in first st of this rnd – 27 sts. Rnd 5: Attach new color to first tr from the previous rnd, ch 1, sc in same st, *4 sc in next ch-3 sp, sc in next st, sc in sp between sc and dtr, sc in next st, sc in next ch-1 sp, sc in next st, sc in next ch-1 sp, sc in next st, (sc, ch 2, sc) in ch-3 sp (corner), sc in next st, sc in next ch-1 sp, sc in next st, sc in next ch-1 sp, sc in next st, sc in next sp between tr and sc, sc in next st, 4 sc in next ch-3 sp, sc in next st; rep from * once more, 4 sc in next ch-3 sp, sc in next st, sc in sp between sc and dtr, sc in next st, sc in next ch-1 sp, sc in next st, sc in next ch-1 sp, sc in next st, (sc, ch2, sc) in ch-3 sp (corner), sc in next st, sc in next ch-1 sp, sc in next st, sc in next ch-1 sp, sc in next st, sc in next sp between tr and sc, sc in next st, 4 sc in next ch-3 sp, sl st in first st of this rnd – 75 sts. Note: Work Triangles 1-9 for Small Bunting, Triangles 1-11 for Large Bunting. Rnd 2: Work in B.
Rnd 3: Work in D.
Rnd 4: Work in C.
Rnd 5: Work in A.
Rnd 1: Work in A.
Rnd 2: Work in A.
Rnd 3: Work in B.
Rnd 5: Work in D.
Rnd 2: Work in D.
Rnd 3: Work in A.
Rnd 5: Work in B. Row 1: Ch 55, sc in next 27 sts along one side of Triangle 1, ch 1, sc in next 27 sts along one side of Triangle 2, ch 1, sc in next 27 sts along one side of Triangle 3, ch 1, sc in next 27 sts along one side of Triangle 4, ch 1, sc in next 27 sts along one side of Triangle 5, ch 1, sc in next 27 sts along one side of Triangle 6, ch 1, sc in next 27 sts along one side of Triangle 7, ch 1, sc in next 27 sts along one side of Triangle 8, ch 1, sc in next 27 sts along one side of Triangle 9, ch 55, turn. Row 2: Ch 1, sc in same st, sc in next 54 sts, sl st in next 27 sts, *sc in next st, sl st in next 27 sts; rep from * 7 more times, sc in next 55 sts. Row 1: Ch 55, sc in next 27 sts, along one side of Triangle 1, ch 1, sc in next 27 sts along one side of Triangle 2, ch 1, sc in next 27 sts along one side of Triangle 3, ch 1, sc in next 27 sts along one side of Triangle 4, ch 1, sc in next 27 sts along one side of Triangle 5, ch 1, sc in next 27 sts along one side of Triangle 6, ch 1, sc in next 27 sts along one side of Triangle 7, ch 1, sc in next 27 sts along one side of Triangle 8, ch 1, sc in next 27 sts along one side of Triangle 9, ch 1, sc in next 27 sts along one side of Triangle 10, ch 1, sc in next 27 sts along one side of Triangle 11, ch 55, turn. Row 2: Ch 1, sc in same st, sc in next 54 sts, sl st in next 27 sts, *sc in next st, sl st in next 27 sts; rep from * 9 more times, sc in next 55 sts. Wet block bunting to size and shape. Use tapestry needle to weave in all ends. 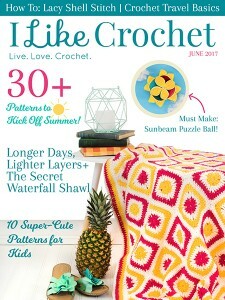 Do you have a video tutorial of this pattern? 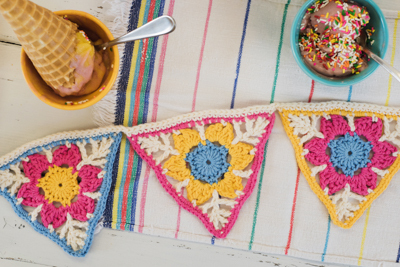 The flower was easy, but I find it difficult to understand the bunting portion. Why is this called a bunting? I was searching a cocoon like baby bundler and this is a party or event banner. So disappointing when searching. Where are the pictures of items?